Interested in history of the US presdency? Welcome to the inaugural episode of the THINK BIGGER, THINK BETTER podcast, where we explore science, philosophy, business, and our human future. I am your host, Paul Gibbons. Every other week, I will be bringing you conversations with a wide range of scientists, philosophers, public intellectuals, and business and political leaders on the most important issues of today. On this episode, I’m talking with Jeremi Suri, one of the leading historians writing about American politics, leadership, and foreign policy. He is the author and editor of nine books, including seminal books on security, détente, Kissinger, statecraft, and the Cold War. 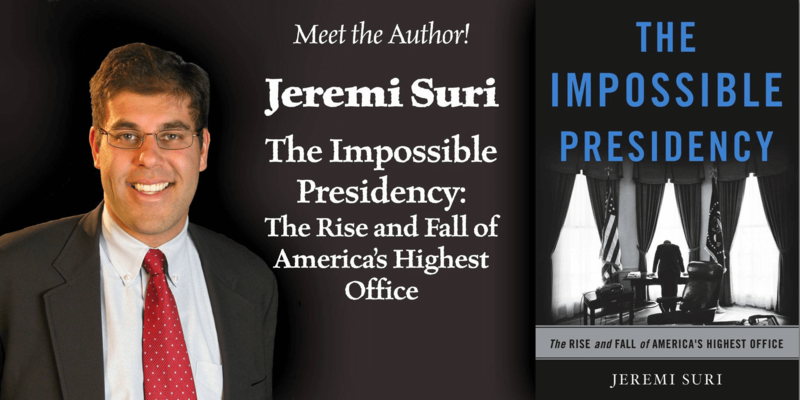 In his latest book, The Impossible Presidency: The Rise and Fall of America’s Highest Office, Jeremi examines the evolution of the office of the President of the United States and the men who have held that position. We discuss how the role has changed and why many of our most recent presidents seem to have failed so miserably, and what President Trump might learn from studying presidential history. Join us for this exploration of the American presidency and how today’s situation fits in the arc of history. How taking an interest in history can enrich our lives as citizens and move our society forward. Why so many recent American presidents have failed miserably. How the current administration is typical of historic presidencies and how it is different. The direction Jeremi sees America trending toward. Leave a comment below this post or on Facebook or Twitter. Please put me in your email list of future programs, books etc. This was a good interesting, enjoyable episode to hear. Why thanks immensely if I have not already said so! Have added you to the list where new podcast are announced. Thanks Mark. If convenient for you, the email list on my website will make sure I let you know (bi weekly) of releases.